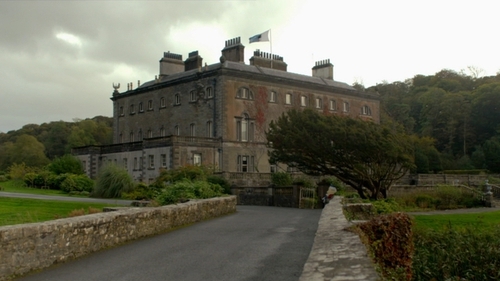 Westport House in Co Mayo has been sold to a local family, who have announced plans for a major investment at the estate over the next five years. The Hughes family, which operates Hotel Westport, says it will spend €50 million on refurbishment and upgrading works, creating 200 jobs over the duration of the development. All existing staff will be kept on and the new owners say they will honour all bookings into the future. Speaking at a press conference in the house this morning, Cathal Hughes said that his family was committed to ensuring the property was given the attention and care it deserved. Final agreement on the deal was reached earlier this week. It brings to an end the ownership of the Browne family, who have links stretching back several hundred years with the estate. Along with his two brothers, Mr Hughes is planning to provide accommodation on the 450-acre site. He said his family was delighted to be able to make such a significant investment in their local town. Minister of State Michael Ring said the investment was a major boost for the town and the wider Mayo area. He paid tribute to those involved in extensive negotiations in recent months. Speaking on RTÉ's News At One, he added: "The people of Westport are quite happy now to know that it's not in the hands of somebody in Russia, France, Germany or somewhere else. It's a Westport family who love Westport and love the house." The house was put on the market last year, with a €10 million price tag. The detail of the final agreement between the Browne family and the new owners is not being made public. The purchase has been welcomed by Mayo County Council, who took over a NAMA loan on part of the estate to facilitate the transaction. All existing staff at the house are being kept on and the new owners say they will honour all contracts that are in place.